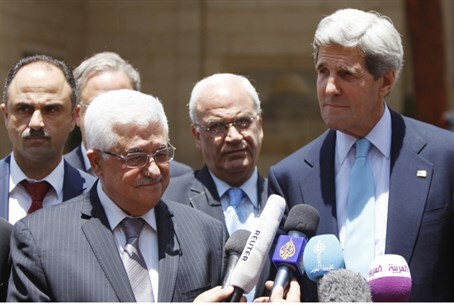 PA spokesman says Abbas has rejected every offer put forth by John Kerry on Jordan Valley security. A Palestinian Authority (PA) official involved in talks between the PA and Israel said Thursday that PA Chairman Mahmoud Abbas has rejected every offer put forth by United States Secretary of State John Kerry regarding security in the Jordan Valley. The source said the security arrangements Kerry proposed were unacceptable because they would not prevent Israelis from continuing to live in the region. Kerry’s proposals were controversial among Israeli politicians. MK Moti Yogev (Jewish Home) said of the arrangements, “We are not interested in the security arrangements that the Americans are trying to sell us in the [Jordan] Valley or the [Temple] Mount." Yogev told Kerry, "We saw what happened as a result of security arrangements like these, after Oslo and saw how you retreated from the position of pressure on Iran and allowed it to become a nuclear threshold state which threatens Israel." “There is only one state between the Jordan River and the Mediterranean: the state of Israel, which defends itself, with G-d’s help,” he concluded. Earlier, Deputy Defense Minister Danny Danon said Israel must clearly tell Kerry that it will not sign an agreement that would put Israeli lives at risk. Justice Minister Tzipi Livni, who is in charge of Israel’s delegation to the talks, said of Kerry’s proposals, “I believe that a diplomatic agreement is a necessity, nationally, economically and in terms of security. So in any agreement, we need to protect our security interests,” hse said.